TinyMCE widget by Black Studio is a very popular widget. 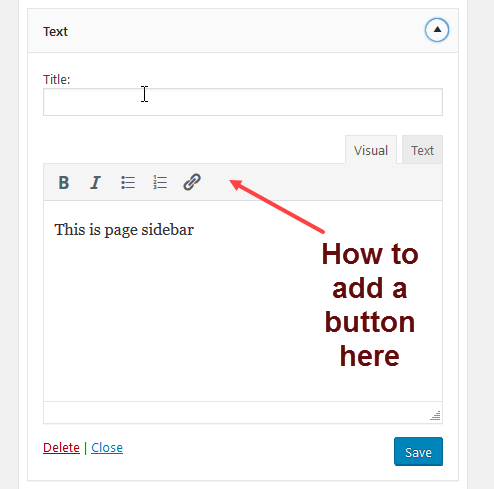 What about adding a TinyMCE (rich text) widget to WordPress Core? text-widget.png​ (20.0 KB) - added by melchoyce 2 years ago. 35243.0.diff​ (19.5 KB) - added by westonruter 2 years ago. 35243.diff​ (23.5 KB) - added by obenland 2 years ago. Should this be adding a new widget or just extending the Text widget to allow a “visual” mode to accompany the current default HTML (with wpautop checkbox)? This to me would seem much more user friendly, as I imagine most users wouldn't be wanting to enter raw HTML into a widget to achieve the desired results. This ticket was mentioned in ​Slack in #core-editor by paaljoachim. ​View the logs. Summary changed from Adding a TinyMCE widget to Core? to Extending the text widget to also allow visual mode. That is a very good idea Weston! I don't really like this idea. TinyMCE carries a fairly large overhead to it, and this is going to create another place that needs to be tested for all of our editor changes. Would love to hear what @iseulde or @azaozz think since they are the editor gurus. I can imagine if I were an end user/producer, though, that it would be very unhelpful/non-intuitive that I wouldn't be able to put rich text into a text widget. Users aren't going to know they have to enter HTML, and that is definitely not user-friendly. I agree that the text widget should have some basic text formatting options, like bold, italic, lists, and links. Maybe even media. ;) (#32417) As a user, I expect to be able to add a link to my widgets without needing to know HTML. It would be pretty bad to repeat the errors from the "Custom CSS" implementation. First thing to do when core is "absorbing" the features of a plugin is to contact the plugin's authors, and try to get them on board. If nothing else, this is a common courtesy. There was a Feature Project to add a Media (image/audio/video) widget. Is it worth merging with it or taking it over? Having HTML editing support would also mean the users will be able to add media there. Think we should fix/improve/change the way widgets are saved before we start expanding them. Saving widgets data in a custom post type makes most sense as far as I see. Implementing that API change, together with a way to convert old widgets data, should probably happen before we "absorb" that plugin functionality into core. I'm not sure if there are any plans for the UI in the customizer (is the mockup above for the "Widgets" screen or for the customizer sidebar? ), but editing inline, i.e. not from the customizer sidebar or from a popup, would make things 100 times better. Agreed. We need to do better at communicating with existing plugin authors. I will note that one of the authors was involved in writing Custom CSS and the Jetpack team was pinged, but we fell short at connecting until too late in the cycle. My interest in adding TinyMCE to the Text widget in JS Widgets plugin is as a demonstration/prototype for how JS components can be integrated with a newly proposed JS-based widget foundation. The JS Widgets plugin is not anywhere close to merging so the TinyMCE Text widget would just be living there as a proof of concept that could in the future be incorporated into core after the proper feature plugin/project merge process. In other words, no core patch is in view here for the immediate future. I believe this is #32417, which has an overwhelming number of watchers and support. I recall it got bogged down with scope. @melchoyce do you see a TinyMCE Text widget being a simplification/superset of the media widget? I think the mockup is for how the widget would by default appear on the widgets admin screen and customizer alike. Inline/frontend editing of customizable elements (partials) doesn't yet have a ticket, AFAIK. But I think there are some good opportunities for allowing a widget control to appear floating next to a given rendered widget or also for the title and content (of the Text widget) to be edited inline with direct manipulation. There might still be merit to a standalone media widget, but I would be totally satisfied with having an "add media" button in the text widget. Migrate all text widgets to this type. Store this widget as a special built_in post type. Special case: If such widget is changed from option 1 to option 2, the content is copied, may be modified and do no longer show the (possibly changed) content of the original post. Similar to menu labels for pages. We could consider renaming it to something like "content," but I honestly don't think it's that big of a deal to keep calling it "text," even if we do add an "add new media" option. Especially if we build a standalone media widget that can complement it in terms of findability. Sure, we should do that. Think the proper way would be to have "lighter" editor UI that is non-WYSIWYG as there will be a preview on the same screen (i.e. white background, standard text size, no theme specific CSS, etc.). However for the core text widget we should do a "full blown" editor instance that has the same features as the "main editor" on the Edit Post screen, perhaps without most WYSIWYG enhancements as a full preview will be right there. I agree widgets need architectural improvements before we start focusing on creating new widgets significantly. Storing widgets as a custom post type is proposed in #35669 (with feature plugin), however I don't think it's necessarily a dependency. Right, not a dependency, but would be nice to get done together. Expanding the text widget to support HTML and most (or all?) features of the post editor (embeds, galleries, images with captions, etc.) will make it a lot more popular. At the same time it will need more space to save its content. Would be good to remove the limitations of saving widgets data as options. #33507 and #35574 sound good but perhaps they go in another direction and/or don't go far enough. We are planning to change the way widget data is stored completely, and to import the old widget data. When we do that many things will be improved significantly, including the enhancements from these two tickets. Inline/frontend editing of customizable elements (partials) doesn't yet have a ticket, AFAIK. But I think there are some good opportunities for allowing a widget control to appear floating next to a given rendered widget or also for the title and content (of the Text widget) to be edited inline with direct manipulation. If not possible (yet), we should probably add a "full-blown" editor instance but without WYSIWYG enhancements (see above). One thing we can try in this case would be to make the editing form as wide as the actual widget. Yeah, exactly. Thinking we should add "full featured" editor there, same as on the Edit Post screen. It will support galleries, images with captions, embeds, even shortcodes. This will make the "Text widget" a true "side content" capable. Then the users will be able to decide if they want just an image, a video, an audio, bunch of links, styled text or all of the above in it. "Full featured" as in "exactly mimics the editor," or "full featured" as in supports views and has some formatting available? I don't think the text widget needs to be any more complex than what I mocked up in terms of interface — for example, I don't think it needs the kitchen sink. B/I/Lists/Links seems like an adequate first step towards making the text widget a better, more modern experience. @azaozz also I understand that without #35760 it isn't currently feasible to make the full featured WP TinyMCE editor available in the Text widget since it currently requires wp_editor() to be called in PHP for each instance and new editors can't be dynamically built for new instances of Text widgets that are added. Is that accurate? If the Editor was not the full editor but rather a vanilla TinyMCE editor, then it seems it would be more feasible to dynamically instantiate new ones in JS however. Nevertheless, one key feature of the Text widget visual editor would be the WP Links interface which isn't part of vanilla TinyMCE. Do you or @iseulde have recommendations on the JS code required to dynamically create new basic editors as mocked by @melchoyce? One more question regarding the Text widget: what should be done about the “Automatically add paragraphs” checkbox (the filter property)? It means whether wpautop is applied. But if it is a TinyMCE editor then really this means that shortcodes would need to be allowed and so really it needs to apply the_content filters which will include wpautop but also wptexturize and also do_shortcode among others. See previously reported in #10457 (Parse shortcodes in text widgets by default)… which is 7 years old! But applying these other filters will likely have back-compat implications. Also, applying the_content filters may not work as expected always because the filters running will amy expect a $post global to be set which corresponds to the content being filtered. In any case, I think it only makes sense to show the filter checkbox when the non-visual editor is shown. We could employ a back-compat solution whereby we introduce a new tinymce property for the Text widget which gets set to true when the Visual editor is shown. If the property is false (or absent) then the HTML tab should be displayed instead, along with the filter checkbox displayed. Once you select the Visual tab, however, then filter would be implied to be true and the checkbox would be hidden. This will ensure that the Visual editor is opt-in when upgrading WP. "Full featured" as in "exactly mimics the editor," or "full featured" as in supports views and has some formatting available? As in support embeds/views, formatting, etc. but not "exactly mimics". I meant this for the "back-end" of the implementation (load all TinyMCE plugins, process shortcodes, etc. ), not for the UI. I don't think the text widget needs to be any more complex than what I mocked up in terms of interface — for example, I don't think it needs the kitchen sink. B/I/Lists/Links seems like an adequate first step towards making the text widget a better, more modern experience. Yep, the mockup looks great. Don't think it needs more buttons. Can also add all the keyboard shortcuts as in the "main" editor. Not quite. wp_editor() was made so plugins can add an editor exactly the same as the "main" editor, with the same features, plugins and UI. Once TinyMCE is loaded on a page, we can initialize (from JS) as many instances of it as we need. This is currently not supported as separate option in wp_editor() as that function also outputs the HTML around both editors. If that HTML is generated in another way, we can initialize an unlimited amount of other instances (as long as the browser has enough memory/CPU power), either with the same configuration or different. Yes, one of the harder things would be to add the (old) wplink dialog as it is external to TinyMCE. The new inline link would work properly as it is essentially a TinyMCE plugin. Until #35760 is done, the best way would be to load wp-tinymce.php or tinymce.js directly the same way as in class-wp-editor.php: https://core.trac.wordpress.org/browser/tags/4.7.1/src/wp-includes/class-wp-editor.php#L1245 including the translated strings. Then initialize it with a "mostly hard-coded" init settings. It will still need tinyMCEPreInit object with baseURL and suffix properties that come from PHP. Most of the actual init options should be filterable only in JS. Think this is the better option as if we use all available PHP filters from class-wp-editor.php, the Text widget instance of the editor will end up affected by most WordPress plugins that are meant only for the main editor. Once the init options object is created (and filtered), we can initialize as many editor instances as needed. Note that the editor, once initialized, cannot be moved in the DOM. This is a security limitations for iframes in all browsers. If moving is necessary, it has to be unloaded, then initialized again. Think we can assume autop is needed for the Text editor. Also, nearly all "full HTML" can run through wpautop without functional change. I mean, even if autop is not needed and all <p> tags are in place, we can still run it through wpautop without breaking anything. This would be enough for back-compat imho. I think we should probably mimic the editor. The "add paragraphs" checkbox never made any sense to me other than "people don't have a way to add paragraphs without manually coding p tags so I guess we need to add an option to add them for people instead." In any case, I think it only makes sense to show the filter checkbox when the non-visual editor is shown. Could this be a good compromise to handle back-compat? Supporting Revisions, Template files and all good features of post types. so that they will work out of the box supporting plugins like ACF for create widgets on the fly. @superbotics what you're proposing is out of scope for the enhancement in this ticket for the Text widget. What you are describing may indeed be part of the work on editor blocks this year. This ticket was mentioned in ​Slack in #core-customize by melchoyce. ​View the logs. It also comes with column creation features. Just adding .02 here. I'd suggest focusing on inline formatting (links, bold, italic, etc.) initially and leaving out media or other blocks. That could create issues with widgets being blocks in a block-based editor, but this particular widget block containing multiple types of content as blocks in a way that may not make sense down the road. Another thought - perhaps the existing text widget should transition into an "HTML" or even just "Text" (like the editor tab) widget and content should be handled via other distinct blocks within widget areas, such as a media block/widget. That seems like a potentially better concept long-term within the block paradigm. Otherwise, nesting blocks could feel very odd and unintentional here, with a text widget that largely acts as its own block container/sidebar/content area. I was with the impression that we want a "universal" widget that will support the same content as the post editor. I really like the mockup which has the "Add Media" button suggesting you will be able to add images, videos, embeds, galleries, etc. The users will be familiar with how to use it from the start as the workflow will be identical to editing a post. We will avoid adding 5-6 different widgets for different content and with different controls, restrictions and workflows. It will be very inferior to what's available in plugins. Not really sure why we would want to add that to core given the opportunity for something much better. We will (eventually) have to add many different widgets for the different content: video, audio, galleries, embeds, etc. As it would support HTML, some users will eventually learn to paste the media types we excluded. For example it will be very easy to compose the content in the post editor then copy and paste the HTML. Forcing the users to do that by not providing sufficient UI would be a failure imho. Also, regardless of whether we add media support or not, adding HTML support to the text widget makes the "Media Widget" #32417 completely redundant. I mean, there will be two widgets that will do exactly the same thing but have different UI (either the Media Library, copy/paste HTML, or yet another new UI in the media widget). That's not going to be good UX. My understanding of widgets is that they're intended to be distinct blocks of (often dynamic) content. They're the type of thing that a post or a sidebar/widget area may be made up of. A "universal" widget would behave similarly to an entire area, confusing the block concept by requiring some things to be nested blocks within a block that's essentially nested within an area of the same block unnecessarily, and where you can't continue nesting and organizing any type of block. With a new block based editor, I would expect widget areas to behave the same way that content areas do - as an area where you can add text or other types of blocks. Introducing a distinct widget block that has this functionality, particularly in the form of an editor interface that we're moving away from, doesn't make sense. My understanding of widgets is that they're intended to be distinct blocks of (often dynamic) content. Keeping the editor simple encourages the user to keep the widget content simple. And I don't understand why it's so difficult to add a call to filter the widget with do_shortcode in core since shortcodes are a core thing. I'm not saying the output of a shortcode should be visible in your new Visual mode, just that shortcodes should work in text widgets because they work in content. The main challenge I see with shortcodes in the text widget is that certain shortcodes presume that they are being rendered in the context of the_content for a given post. Since a widget instance is not a post (yet, but #35669) these shortcodes could behave unexpectedly, such as if they are trying to obtain all of the attachments for the current post (as gallery does) or aggregating postmeta for display. There would need to be restrictions on which shortcodes would be allowed, or at least shortcodes would need to be educated on this new context. Search for rich text in the plugin directory, as there are existing plugins that implement rich text editing for various portions of the admin. This ticket was mentioned in ​Slack in #core-customize by azaozz. ​View the logs. After the patch on #35760 we should be able to make this enhancement relatively easily. As there are separate media widgets, the Text widget would be "pure" HTML. We should add the TinyMCE buttons and the corresponding Quicktags buttons for the Text tab, then disable the wpview plugin as oEmbeds won't be supported (they require a post_ID to work). Also think the wpautoresize plugin and the TinyMCE media plugin won't be needed here. As there are separate media widgets, the Text widget would be "pure" HTML. So you don't think that the existing Text widget should be upgraded to support a Visual mode? You think there should rather be an entirely new widget type introduced? That would certainly make things easier for back-compat and migration, since there wouldn't be any such work to do. So you don't think that the existing Text widget should be upgraded to support a Visual mode? Uh, sorry, that's not what I meant :) The Visual and Text editors, formatted text, lists, links, etc. as opposite to having images, galleries, videos, etc. (same as Mel's https://core.trac.wordpress.org/attachment/ticket/35243/text-widget.png). On the other hand, as you mention it is probably worth exploring adding a new widget and even deprecating the current widget (hiding it in the UI) if it is not used. I don't think back-compat will be particularly hard, but it is true that many users have pasted many different "things" in the Text widget over the years and chances are we may break something. The only back-compat decision for the default Text widget would be about the autop chechbox. I think we should remove it completely. Then if $instance['filter'] is set, can run the content through wpautop on loading and displaying, but save the <p> tags and remove $instance['filter'] when editing. This would make it better and simpler. Few months ago, I have created WP plugin to enhance Text Widget functionality. ​https://wordpress.org/plugins/visual-text-editor/ It unregister Text Widget and register a new widget using same widget id as Text Widget. A new widget_text_content filter is introduced which applies on the text instance property with wptexturize, wpautop, convert_smilies, and capital_P_dangit… the filters for the_content which do not depend on there being a global post. Note that embeds and shortcodes are not processed. The filter property is removed from the widget instance when it is updated. The new widget_text_content filter applies after widget_text and it will only apply if the filter property is not set, so that the new filters will only apply once a user has touched a widget with the new TinyMCE editor active. The feature plugin subclasses WP_Widget_Text whereas the core patch would actually modify the class itself. In the customizer, changes to the visual editor get synced to the changeset and previewed after 1 second to reduce the amount of refreshes as changes are made (see also #38954). Every time you hit the Save button on the widget in the widgets admin screen, a flicker is currently noticeable as the TinyMCE editor has to be re-initialized. Ideally we could avoid this. Assigning to @westonruter, as all tickets milestoned for 4.8 should have an owner at this point. Core patch split out from plugin is ready. Please test. I want to commit it to trunk by EOD Wednesday PDT. Widgets: Ensure return value of widget_text filter is not dropped but passed into widget_text_content filter for rendering. Widgets: Add missing wp-editor-area CSS class for textarea in the TinyMCE-extended Text widget to ensure proper styles are applied. Removes extra border around TinyMCE-wrapped textarea and removes gap at bottom due to lack of display:block. How do i extend the textwidget tinymce available formatting buttons with my own? How can i add a extra icon? Can anybody shine a light on that? @BackuPs no need to re-open the ticket. Thanks to @azaozz for working out this example with me ​over Slack. This is so very late and I should have posted this months ago... I apologize for not doing so. I miss not being able to select alignment and paragraph/headings. Sometimes one just needs to add some text with a link with some header text and paragraph text and perhaps even align the header in the center and the rest as default left. I feel that the updated widget has been too limited. I am not sure if it the image will show up. My thoughts are on then adding alignment and the heading/paragraph drop down to make the widget even more useful. Thanks. Widgets: Add widget dedicated for HTML Code, taking over this role of the Text widget. Other related bugs are filling up with issues around code being removed by this new feature. This need to be reverted in 4.8.1 and re-introduced as a Rich Text widget. IMHO this is an urgent issue that needs to be resolved asap. I could not agree more... but this will be like talking to a deaf person if you ask me as i dont expect the wp core team to acknowledge or change this. This issue was closed on a completed milestone. Comments should be directed to #40951. @BackuPs We are definitely evaluating options and will have a proposal today. Please keep comments constructive. Widgets: Add accessibility mode support for TinyMCE-enhanced Text and Media widgets (Video, Audio, Images). Widgets: Enqueue assets needed by media and text widgets in their _register_one() methods. The WP_Widget::_register_one() method is more guaranteed to be called as opposed to its wrapper WP_Widget::_register() which plugins may bypass for performance reasons. Widgets: Add legacy mode for Text widget and add usage pointers to default visual mode. The Text widget in legacy mode omits TinyMCE and retains old behavior for matching pre-existing Text widgets. Usage pointers added to default visual mode appear when attempting to paste HTML code into the Visual tab and when clicking on the Text tab, informing users of the new Custom HTML widget. Props westonruter, melchoyce, gitlost for testing, obenland for testing, dougal for testing, afercia for testing. Merges  to the 4.8 branch. Widgets: Check for existence of wp.customize.state before attempting to access in Text widget. Widgets: Improve Text widget's reliability in syncing Visual tab's contents with Text tab and with hidden sync inputs. Props azaozz, westonruter, rinkuyadav999 for testing. Widgets: Rename Text widget's legacy mode to non-visual mode, restore boolean filter prop, and improve compatibility for widget_text filters applied in Custom HTML widget. Props westonruter, obenland, timmydcrawford for testing. Widgets: Improve notice in Text widget's legacy mode. Also fixes phpunit test which broke in . See #41394, #35243, #40951, #40907. Retains 'new' in notice on 4.8 branch, in contrast with . Also fixes phpunit test which broke in . Customize: Update Text widget starter content to utilize visual mode. Widgets: Fix extensibility of Text widgets so that JS logic will initialize on subclassed widgets. Widgets: Prevent visual Text widget from decoding encoded HTML. Also apply the_editor_content filters on widget text with format_for_editor() as is done for the post editor. Merge of  to the 4.8 branch.